For the AAI Apprenticeship 2019 training in AAI Western Region, recent AAI Apprentice Recruitment 2019 is published. Participants download your AAI WR Apprentice Application Form @www.aai.aero. 22nd Jan to 18th Feb 2019 is the offline forms accepting dates. 264 Graduate Apprentice, Diploma Apprentice, ITI Trade Apprentice positions will be filled by the talented candidates. Airports Authority of India (AAI) from this AAI WR Apprentice Notification suggests the essentials requirements be possessed by the postulants to apply offline for AAI Apprentice Recruitment 2019. Airports Authority of India (AAI) opens the first employment advertisement with a 264 Vacancy. So now we are discussing the AAI Western Region Apprentice Recruitment 2019 details. In response to the notification, applications from the ITT, Diploma, Graduation completed candidates. With no other additional qualification, postulants with any one of the academic qualification can make the successful registration of AAI Apprentice Recruitment 2019. Here the important point is the claimants have to post the application form through the normal post to the office address that is very clearly given at our page. Nominees even from our page only download the AAI Apprentice Application format. 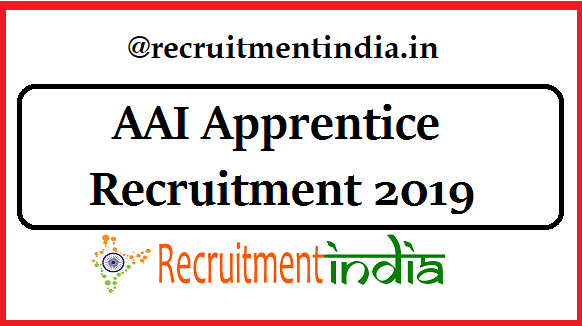 AAI Apprentice Recruitment 2019 process will give the joining letters to the candidates who sent the offline application and correctly submitted the educational certificates. AAI don’t want to conduct an exam to the applicants. Simply on the basis of the academic percents, the chance of appearing in the AAI Apprentice Document Verification round is given. Apprenticeship training fascinated candidates must not miss out to apply this AAI Western Region Apprentice Recruitment 2019. Airports Authority of India (AAI) is the Central Government organization. To the candidates who joined in this AAI have so much to learn. The work experience in AAI will greatly help the postulants to have good career growth. AAI inviting the AAI Apprentice Applications from the candidates who did the Graduation in the relevant discipline/Diploma in the relative dept/ ITI Certificate in the related trade from a recognized board. Airports Authority of India (AAI) in addition to the educational qualification also looking for the age limit. So for this latest AAI Apprentice Notification, the age limit is as follows. When the submission of AAI Apprentice applications is over, the Airports Authority of India (AAI) conducts the select the candidates on the basis of the following rounds. Total vacancy positions in the Cadre of Apprentice in the AAI Western Region are 264. Department wise the vacancy count explains below. AAI Apprentice Application fees amount has be depoisted can be checked in the official notification. In the AAI Apprenticeship 2019, intensive training will be given to the ones who are fortunate enough to get into the training. Really, this was a surprising recruitment notification to the Apprentice type of jobs seeking individuals. AAI 264 Apprentice Vacancy details which are to enquired by the applicant before taking the decision of applying for the recruitment are furnished here. Those details are academic qualifications, maximum age, the procedure of submitting the application form etc are mentioned in the official Airports Authority of India 264 Apprentice Notification. For easiness and quick remembering of all these specifications, here we have posted the section wise details. Once you have got the overview of AAI WR Apprentice Recruitment 2019, then start applying in offline mode. Present most of the recruitments are organizations are preferring the online mode of registration, so job seekers have habituated with the online mode. Unlike other recruitments, this AAI WR Apprentice Recruitment registration is not online. Applying ones, themselves have to download AAI Apprentice Application Form from the AAI careers portal or from our page. This form has to be taken in xerox copy form to write your own details without own handwriting. www.aai.aero Apprentice Offline Form has to be filled by the applicants only. Up to the office hours of 18th Feb 2019 the Airports Authority of India, Western Region, Mumbai recruitment board approves the applications. The marks in the form must be truly entered as these are considered in the AAI Apprentice Selection process. Detached application with the AAI Apprentice Recruitment 2019 notification is given below.